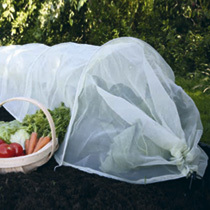 The ultimate insect barrier for fruit and vegetables! It has an ultra-fine mesh size of 0.6mm x 0.6mm, which is small enough to keep out Cabbage Root Fly, Carrot Fly, White Fly, Onion Fly, Flea Beetle, Vine Weevil, aphids and others, while at the same time allowing air and water to pass through easily. Made from U.V. stablished, 90gsm mono-filament woven polyethylene with a soft green tint that retains warmth and prevents scorching. Its drawstring ends can be left open or closed. And, with rust proof galvanised steel hoops built in, the tunnel folds away quickly and neatly. Length 3m (10'), width 60cm (2'), height 45cm (18").